Cycling Paradise: From small country roads to solitary mountain passes lost in the clouds, Oisans is a very popular area for cycling. Come and explore the six valleys of this fantastic area with its winding roads, its perched villages, sitting on mountain tops like eagles’ nests, or its more gentle roads opening up its hidden valleys. As you will see, each road has its own history and each village has its own distinctive character. Oisans hosts spectacular mountain bike competitions such as ‘Megavalanche’, the longest MTB downhill race in the world, starting in Alpe d’Huez and finishing 30km and 2800m further down. There are events for everyone to participate in and with the cable car open all year round, the route up the mountain could not be easier! whether you choose the peace and tranquility of fishing or the excitement of white water rafting, you can find it here, with over 200km of streams and rivers and many mountain lakes. Sailing, kayaking, rafting and canyoning, swimming pools, fountains in the summer, the water offers a wide range of refreshing possibilities. Getting to Bourg and Alpe d'Huez: Our closest airport is Grenoble, a small provincial airport that is wonderfully quick to get in and out from. Ryanair fly all year round and Easyjet in winter. Grenoble airport is 56 miles and about an hours drive from Bourg. We recommend pre-booking car-hire or you can take the transfer to Grenoble City Centre and a bus from there. Almost as easy is Lyon airport which is 85 miles and about an hour and a quarter drive. British Airways and many of the low cost airlines operate flights to Lyon and there is more choice to Lyon from airports in the Midlands and the North. Some guests also fly into Geneva which is about 2 1/2 hours drive. Grenoble train station and city centre is 44 miles from Bourg d'Oisans with a number of buses available. If you prefer to drive it is 8 to 9 hours from Calais or Boulougne. It's an easy, if long drive, as the motorways tend to be much quieter than the UK. The tolls are about 80 euros each way. We had a lovely stay during our holiday. The house has a lot of rooms and 2 bathrooms which it’s great with a large group. We went skiing during our stay and it was a 25min drive from house to the ski lifts. Good location. As described. Church bells bit noisy. Good if towels provided too. Also after we booked we had questions on how to view the race,transportation etc which the owners had no answers(Not 5 star).....When you own a home rental(As we do in Vail CO) in a town its your job to know whats happening and how to do it........Again these are not major complaints but has to be said.I hope this is taken to heart to better the next guests stay. The stay in Bourg-d'Oisan was just right. The house was great for our group and the communication with Liz was perfect. 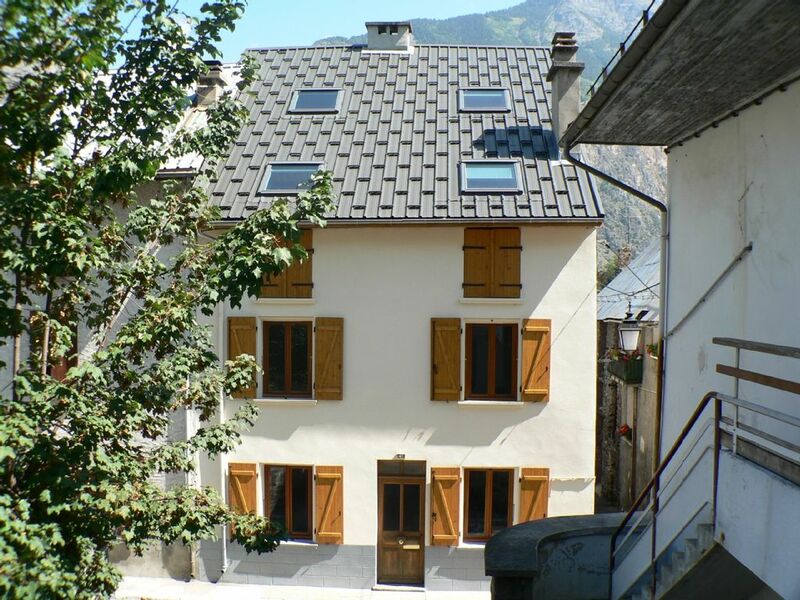 We had a lovely stay and would highly suggest using their property if you want to experience Alps d'Huez, but the feel comfort of your own home. Kitchen was well stocked and the town has plenty of shops and restaurants. I would return! Comfortable, clean and very spacious! Excellent having the second mezzanine living area for our teenage boys to play board games etc, without complaining about the adults talking too much! Kitchen well equipped and plenty of space for the dining table for all to sit around comfortably. (There were 5 of us.) Bathrooms modern and even with showers all round, didn't run out of hot water! Also, has an actual bath which was a lovely treat. Watch out for the hairpin bends if you are driving to the resort, and the car park is just around the corner. Also, a good bus service for eager skiers which leaves Bourg D'Oisans early in the day or late starters that don't want to get out before noon. Taxis not too expensive if you want to stay late at the resort to enjoy the night-life. Lockers cheap to rent at the resort, so you don't have to lug your ski stuff back and forth daily. In the heart of small town for restaurants in the evening and near shops to stock up, if you want to stay in. No outside space, but lovely little park 2 minutes away to sit out in, if you are not going skiing. We hired both The Granary House and Stable House for a week of cycling and had a brilliant holiday. Bourg d'Oisans is a fantastic base and for the days when some of us didn't want to cycle the outdoor pool is gorgeous and so are the mountains and lakes. Also had a great day out at Vizille. Really well stocked kitchens and huge living room and kitchen/diner in The Stables allowed us all to get together. Local bars, cafes, shops and restaurant are a real French treat. Houses just as described, Liz and Steve easy to deal with it. No hesitation in recommending these houses for a really good summer break, with or without bikes. A charming village where all roads meet, set amidst untamed nature and internationally renowned ski areas, Bourg d’Oisans welcomes you with simplicity and authenticity. In all seasons Bourg doisans is your gateway to the Oisans region. The Tour de France and the Marmotte bicycle touring race have made it into a cycling Mecca. The stunning Ecrins National Park has over 680km of way-marked trails ranging from simple strolls to adventurous hikes. 200km of streams and rivers along with the many mountain lakes offer refreshing possibilities, from peaceful fishing and sailing to the excitement of white water rafting. Whether you wish to relax with the family or enjoy exhilarating mountain sports, Bourg d’Oisans is the ideal base for a holiday. Closer to home 'The Granary House' is only a few steps away from the village pond, childrens play park and picnic area. Please see the Ski section for information about the Alpe d'Huez ski resort which is only 14km from Bourg d'Oisans. Ski: Alpe d'Huez is one of the top five alpine high altitude resorts in France, enjoying the impressive scenery of the Grandes Rousses Mountains. It boasts an excellent snow record, extended season and is ideal for skiers and snowboarders of every level. Alpe d’Huez is served by 240Km of pistes with 88 inter-linked lifts. For beginners the lower slopes provide 39 confidence boosting green runs. Intermediates and snowboarders can enjoy the 32 blue runs as well as 28 more challenging reds with fantastic excursions to the satellite villages. The advanced skier will find some of the most testing terrain in France from the top of Pic Blanc at 3330mts, with 19 black runs including the longest in Europe, 'La Sarenne', and the intimidating 'Le Tunnel'. A snowboard fun park, ice-skating, tobogganing, indoor and outdoor swimming and fully equipped sports centre complete the winter activities. If you favour more extreme sports try skiing off-piste, skiing by night or ice climbing.